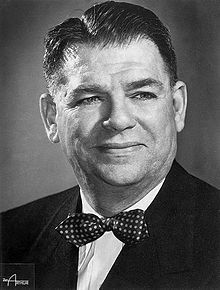 Oscar Hammerstein II (July 12, 1895 – August 23, 1960) was an American writer. He was born in New York City. In the 1950s, he teamed with Richard Rodgers to write several successful musicals including Oklahoma!, Carousel, South Pacific, The King and I, and The Sound of Music. He died of stomach cancer in Doylestown, Pennsylvania, shortly after the opening of The Sound of Music. Hammerstein won the Academy Award for Best Original Song two times. The first was in 1941 for "The Last Time I Saw Paris" in the movie Lady Be Good. The second was in 1945 for "It Might as Well Be Spring" in State Fair. In 1950, the team of Rodgers and Hammerstein received The Hundred Year Association of New York's Gold Medal Award "in recognition of outstanding contributions to the City of New York." Hammerstein won eight Tony Awards. Six were for lyrics or book. Two were for producing the Best Musical (South Pacific and The Sound of Music). Rodgers and Hammerstein won a special Pulitzer Prize in 1944 for Oklahoma! With Joshua Logan, they won the annual Pulitzer Prize for Drama in 1950 for South Pacific. ↑ "Special Awards and Citations". The Pulitzer Prizes. Retrieved December 1, 2008. ↑ "Drama". The Pulitzer Prizes. Retrieved December 3, 2013. This page was last changed on 23 April 2016, at 03:47.